Pleasant Green Grass offers lawn overseeding services in the Apex, Cary, Carrboro, Chapel Hill, Durham, Hillsborough, Morrisville and West Raleigh area. Our overseeding services make your lawn thicker, get rid of bare spots and help your lawn naturally resist weeds. Overseeding is the planting of grass seed directly into existing turf, without tearing up the turf, or the soil. It’s an easy way to fill in bare spots, improve the density of turf, establish improved grass varieties and enhance your lawn’s color. The best and safest way to eliminate weeds in your lawn is to keep the turf thick and healthy. For various reasons, old turf sometimes deteriorates dramatically or dies out completely. Over seeding with an improved grass seed mixture can get new turf growing in bare areas as well as “sprucing up” areas where the turf is thin and unhealthy looking. 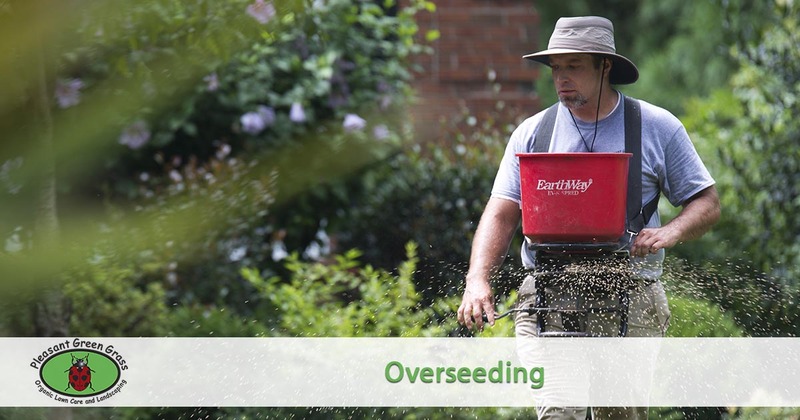 Our over seeding service is designed to replace dead grass and thicken up areas that have thinned out. We start with a double aeration to loosen up the soil making it easier for seeds to take root. Next, we apply Humate Soil Conditioner which helps with seed germination. Finally, we add the grass seed. We use only the highest quality, disease resistant, premium grass seed specifically designed for your growing conditions. If a lawn looks old, or just “worn out,” if it needs growing amounts of water and fertilizer to thrive, or is disease or insect prone, it’s a perfect candidate for one of our many organic lawn treatments: overseeding. Many older lawns were established with common type turf grasses not suited for the needs of today’s homeowner. They’re often more disease and insect prone, requiring more organic fertilization & weed control, and more water. To succeed, seeds need to make good contact with the soil. Before overseeding, mow the lawn to a height of 1 to 2 inches. Remove excess thatch and loosen compacted soil in the existing lawn. Fall (September or October) is the best time to plant fescue seeds, because the young grass will suffer less heat and disease stress. Plant fescues when fall temperature reach about 75 F. The next best time to plant fescue seeds is when rising temperatures in spring reach 60 F. Summer isn’t a good time to plant fescue lawns, because fescue grass tends to go dormant during periods of high temperature. Dormancy means that the grass stops growing, and it occurs for fescues when temperatures are above 90 or below 50 F.
Fescues like well-draining soil and are quite tolerant to drought, once established, because they have a deep root system. Although fescues can go without water for longer periods than many other grasses, planting a new lawn or overseeding requires regular watering until the grass is about 1 inch tall. Choose a fescue variety or mix that is suited for your area. Planting in fall gives the fescue seedlings a longer time to establish before the hot summer season sets in. Prepare the soil as for any other grass seed and keep the seedbed soil moist for at least 10 to 14 days to encourage germination and deep root development. Lastly, you must analyze the problems that caused the original turf to deteriorate. It might be due to conditions that, if not corrected, will eventually cause the overseeded lawn to deteriorate, too. Tired of the bare spots or just having a thin lawn? Let the team at Pleasant Green Grass make your lawn better than all the neighbors with our overseeding service.